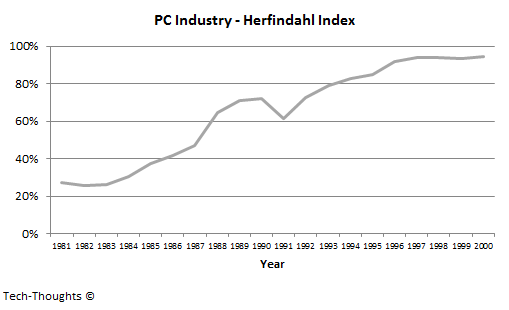 One commonly used measure to gauge industry concentration is the Herfindahl index. It is essentially the sum of squares of market shares of all the players/platforms in the industry. The resulting value varies from 0 to 1, with the higher value indicating higher market concentration. 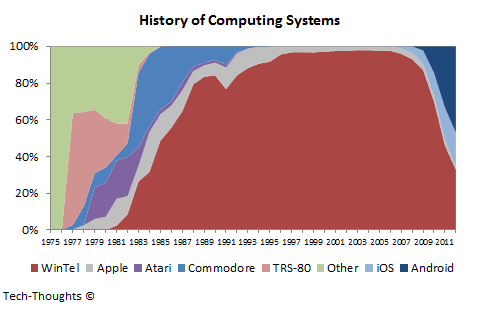 The early years of the computing industry (1975-1980) were obviously very fragmented, with many vendors using mostly proprietary technology. Apple was one of the first innovators in the market to take the PC to mainstream users, but also followed a proprietary, integrated approach. Microsoft & IBM entered the industry with a modular approach and gradually increased their dominance. Increasing industry concentration, in favor of a modular strategy, is consistently seen in various industries and occurs as products from a wide range of vendors become "good enough" for the market. This is usually driven by lower entry barriers for new (usually lower-end) hardware vendors, thanks to easy availability of an ecosystem/platform to plug into. Competing platforms typically fail to create long-term, sustainable differentiation because the market essentially accomplishes the same tasks/jobs using these devices. In addition to this, modular devices end up being far cheaper than those with proprietary architecture. In the mobile industry (both smartphones & tablets), Android was the first platform/ecosystem that provided low entry barriers to new hardware vendors. In the smartphone industry, the subsidized pricing structure initially created an unnatural pricing dynamic that favored high-end vendors, but lately lower-end vendors have been catching up. However, over the next few years, emerging market growth will favor low-end vendors. 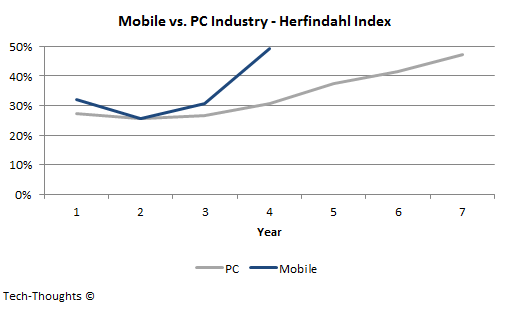 Meanwhile, the natural pricing dynamics in the tablet industry are an ideal fit for the trend we saw in the PC industry.